1986. The house was quiet when I arrived home. I opened a little Coors light and flipped on the TV. Then, the mailman called. We talked about the weather (it was hot) and the rain (it was muggy) and about mowing the yard. That phone call lasted for two hours and two minutes, but it seemed like two minutes. He asked me out, and to make a long story, short… we REALLY liked one another. Here’s the tricky part. Children. Children of a previous marriage. Children of a previous marriage – on both sides. And, a couple that fell head-over-heels in love and fascination — all in two weeks! What fun we had trying to plan “dates” around “kid-weekends” (they were opposite weekends). Most of the “dates” consisted of picnics, fishing trips, dinners at McDonalds – you know the kind of things kids love to do. A few dates were actually in adult venue’s… but not many. With two full time jobs and 4 step children, we had a great adventure! I hope you’ll enjoy the visit. Ask some questions-cause we’ve been there. I hope to share our family with you and want you to share your “step” adventures with me. So, Step In, and join the fun! One of the things I can do whether retired or beyond busy, is pray. A quick prayer is as welcome to the Father as a long, deep conversation because the Father loves his children. 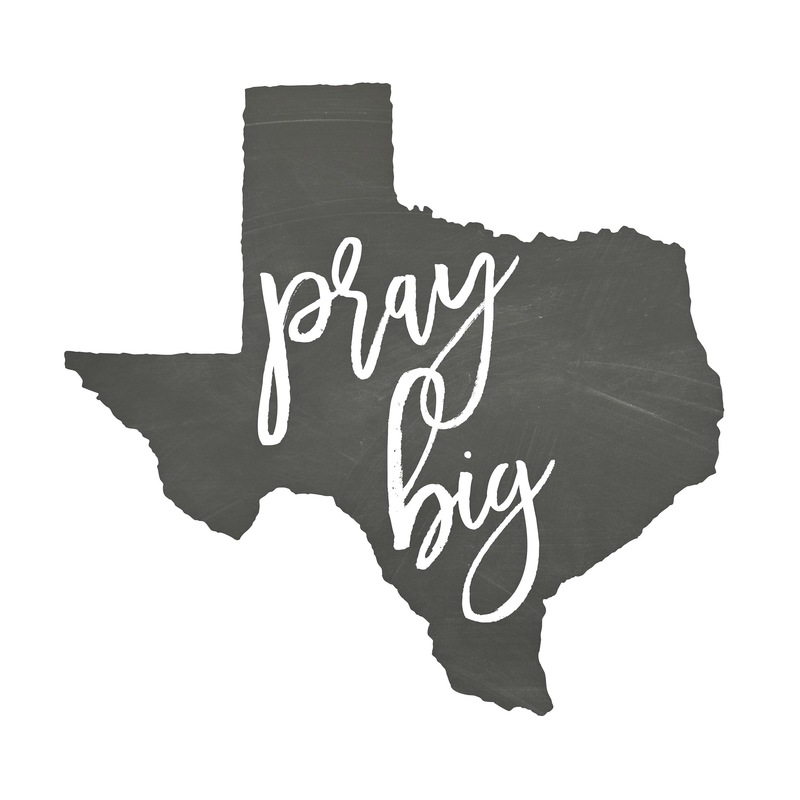 Try it… Father, bless Texas as you see her need. Amen. The sun came out today. I’m about 4-5 hrs. north of the disaster. In the thick of the volunteers. We seem to have been spared the rains, but not the worry and concern for those Texans and our guests trapped in the devastated areas south of here. They are part of our family as sure as the sun came out! In my 60+ years in this great state, I’ve seen many demonstrations of big-hearted giving. Young men from our rural town have gathered their boats, gassed up their trucks and settled their young families. Young women have filled their cars and SUV’s to head south to help. The adults are mentoring the volunteers of tomorrow by encouraging them to gather water, clothing, toiletries, and other suitable donations. The Christians are praying, the government is planning, the people are doing what needs to be done. In our town, everyone has an opportunity to serve. In our town, children are led by example. In our town, the good citizens lock arms and hearts together and reach out when needed down the road. Lately, it seems our differences had driven a wedge in our family. The unforgiving and the negative assumptions have closed the minds and hearts of many. Maybe this rain will soak that wedge to pliable understanding and openness to thoughtful contemplation and unity. Maybe God will be heard and felt and enjoined with us as we stretch to reach those in need. Texas has a giant heart. Don’t worry, I didn’t miss the message… we were talking about having faith in our heavenly Father to keep us safe as we do his bidding and move our lives in the right direction for His glory… not ours. Still, it reminded me why I love what I do! I can’t help but think of the similarity as I begin my follow up routine this Monday morning. I’ve seen many people start to do something they just knew they would love… only to realize their faith in themselves would soon falter and they’d be looking for something else along the way- because their experience wasn’t what they desired. Many times, they just didn’t think it through or don’t have the skill, money or time to devote to a new endeavor. Sometimes it’s not important enough to acquire the skill, set aside the money or devote the time… but they are positive minded and they should be able to “do it”. Anyone can think positive for ten minutes. Anyone can throw money at an opportunity and play at business. Anyone can start an exercise routine and anyone can start saving money. Just because we can, doesn’t always mean we should. Only the strong can keep a positive attitude when the sales don’t come in, or it’s too hot outside to run, or they really want to buy something outside the self imposed budget. Because sales don’t always come in when we want them. Sometimes, we need to leave the house and attend a function or spend .69 on a brochure and drive 15 miles to a location and drink sweet tea with a prospective customer before she will spend her hard earned money with us. Sometimes, she will spend $5.00 and sometimes $50. BUT, the JOY of meeting people and learning about their needs, and being able to HELP is the best feeling in the world. Sometimes, we will sweat and do without. I believe if our faith in our own abilities and willingness to develop ourselves to succeed can thrive, the real winner will be us! It’s not about selling someone more, it’s about meeting their needs, solving their problem or providing a good example for a new team member. Doing the right thing for each person is never wrong. Sometimes someone needs a hand. In sales, we get to meet an awesome person who allows us to come into her life and get to know her. We get to help her solve problems. We get to care that she is here on this earth and how she is making out. Some people need us to care! I’m glad I get to be one of those people. So back to my Monday Follow Up. While I know that not every customer buys every time, and not everyone I believe would make a great business partner will , I KNOW success is somewhere, someone down the line. I stay vigilant and caring and yes, positive minded. I want to call, inquire, share great news and hopefully, provide inspiration. During the week, I meet new people, visit new places and try new strategies. I gather email addresses and phone numbers, connect with others on social media and through referrals. I unfold myself to them at the first meeting and strive for a connection. I pay to play by furnishing the best samples, sales materials and services I can offer. I spend time developing my skill. Without the follow up, we can’t finish the conversation. Did I connect? Will they let me in? How will I help? How can I make a difference? That’s what Follow Up is. Trying to make a difference… in a friendly, business kind of way. Helping someone else take a step out and be there to offer the support they need. Giving my promise to give great service, thoughtful answers and a big hug (or handshake, as needed) . Doing the right thing for the right person. Doing this together. That’s why I love what I do on Monday morning!